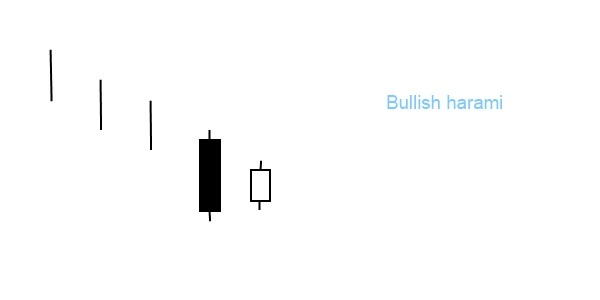 Bullish harami is one of the most common bullish candlestick chart patterns. The pattern consists of two candlesticks, in which the first day’s black candlestick engulfs the following day’s white candlestick. It appears in a downtrend and forecasts its reversal. In Japanese the name harami means pregnant. If we draw an outline around the two candlesticks, it symbolizes a pregnant woman. The most important characteristics of bullish harami are the downtrend, the engulfing first candle and the opposite colours. As in case of all other two-line pattern reconfirmation is necessary on the following days. A bearish harami is also an existing pattern that is just the opposite of this pattern.